Why and When to purge? Dyna-Purge is a mechanical non-abrasive, non-chemical engineered thermoplastic purging compound formulated for efficient and safe cleaning for operators and machines. Dyna-Purge is designed to clean injection molding equipment (barrel, screw, bushing, nozzle, hot runner system) and extrusion, blowing or film production equipment. Dyna-Purge is produced in the United States by Shuman Plastics Inc., which has been the leader in the international market for over 30 years. Dyna-Purge is a mechanical non-abrasive, non-chemical engineered thermoplastic purging compound. It does not cause wear on plastic processing machinery. Dyna-Purge cleans on the first pass, minimizing machine downtime to maximize your productivity. Dyna-Purge is packaged ready to use. There is no soaking, mixing, or waiting necessary, so there are no hidden costs. 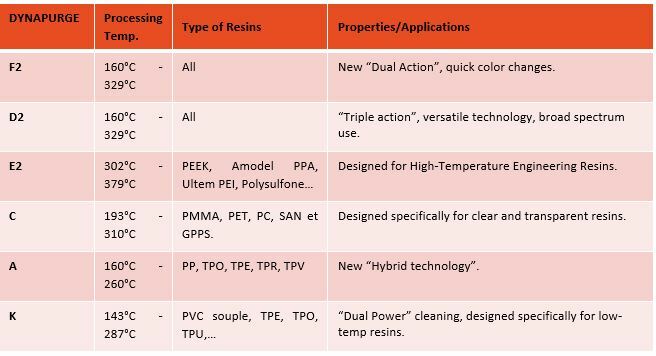 Introduced at the resident resin processing temperature, it does not require adjusting the injection molding or extrusion equipment for temperature or RPM speed. Only a small amount of Dyna-Purge is needed to purge quickly and effectively. Dyna-Purge is thermally stable, it has unlimited shelf life. Ingredients are FDA, REACH and RoHS compliant.